Walk in through two double sets of French Doors off the wrap-around large balcony deck into the beautifully Caribbean style newly decorated private beach cottage. The living area consists of a sofa and matching upholstered chair and recliner. One becomes easily tuned into the satellite TV entertainment center. A separate bar offers additional seating for your entertainment needs. There is a dining table and chairs set up inside in front of the fully operational kitchen if you want to eat-in and walk out onto the large wrap-around balcony to enjoy the sensational sunset. Or better yet, dine outside on the deck and listen to the stereo to set the mood. The master bedroom with its own private bathroom with shower opens out a private French door onto the back balcony deck and stairway. Enjoy Satellite TV or music while dozing off to sleep. The second bedroom is set-up with a double bed and a bunk bed with double bed on bottom and single on top. Satellite TV is installed for private selections in this room also. The large fenced in backyard is children friendly with picnic table and BBQ Grill on the patio downstairs. Pets are allowed with an additional pet fee. Why leave your pets at home when you can bring them! Built in Laundry area is located off Kitchen area for your convenience. 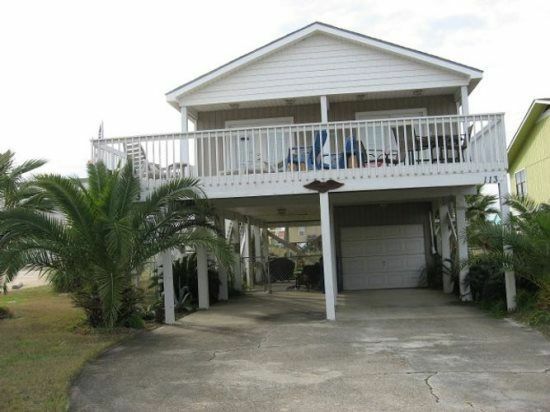 Private Cottage is located less than one mile from Highway 59 and about 400 feet from the gorgeous Gulf Shores Beaches. It is just minutes from local restaurants and shopping. This beach cottage was perfect for our trip. We enjoyed it very much. One negative thing I can say is that the Air Conditioning was not working, we were extremely hot for 3 days. Thank you so much for choosing to stay with us! We do apologize for the A/C troubles you had during your stay and hate you did not make us aware during your stay. Since your departure we have replaced the entire HVAC system! Please feel free to contact us for your next stay on the Gulf! As advertised! Comfortable and Pet Friendly. Just what we wanted! Clean and comfortable. About a block from the Gulf, in a much less crowded area of Gulf Shores. Fenced yard was perfect for pets. Porch was more than adequate, with a portion covered from the sun - nice view of the gulf! Weekend was a bit rainy so we tried to watch a little TV - satellite service was very, very basic but WiFi worked just fine. The ice cream store and the fresh seafood shop across the street were good and could not be more convenient. The restaurant was, however, another story - we ate elsewhere. Convenience store across street was, well, convenient but a bit expensive, even for the beach. Great spot for our family. Close to beach and stores. Felt very comfortable. The house was nice and cozy and close to the beach but on the quiet end of town The Wi-Fi works sporadically and when I went to the Verizon store to find out about using my phone as a hotspot because I had to work while I was on vacation the tech told me that the service provider told him that there were too many people trying to use the service in the area. The owner offered to come out and reset it which I did several times and it worked for a while but then it stopped . It probably won't make any difference if you don't have to work while you're there . The house was well stocked and the beds were comfortable . Be aware that it is next-door to the fire station but they are very considerate about not running their siren until they are out on the street. We felt so at home at the house that we will likely book again and would recommend it highly. It is an older property but is well-kept . Thank you for this kind review! It was a pleasure having you stay with us and we would love for you to stay with us again! Please keep us in mind for any future stays along the beautiful Gulf Coast! Thank you for your kind comments and for staying with us! We take comments like this to heart so we can improve our units to make our tenants stay more enjoyable. It was a pleasure having you stay with us and we look forward to your next trip to the beautiful Gulf Coast!